Fast Draw as we know it today began in California in the early 1950's. Dee Woolem, a stuntman at the Knott's Berry Farm amusement park, decided to see how proficient he could become with the single action Colt revolver he used in his train robberies. He first tried to drop a silver dollar off the top of his gunhand, then draw and fire before the dollar hit the ground. Dee was using the thumb-cocking method, and was able to beat the dollar with a week or so of practice. With improved holster designs and draw styles, Dee was shooting two and three shots before the dollar hit the ground. Dee demonstrating his Fast Draw as Daisy B.B. 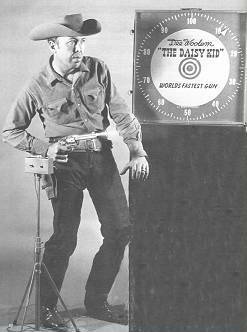 Gun Company's "The Daisy Kid". Draw Championship title four times, and set the fastest self-start record time of 12 hundredths of a second (in self-start events the shooter depresses the timer button with his trigger finger and releases it to start the timer as he draws). After a local TV station aired a segment on Dee and his Fast Draw activities, people wanted to know how they could get into it themselves. Dee ended up leaving Knott's and promoting Fast Draw for the Great Western Arms Company, Crossman Arms, and Daisy B.B. Gun Company. Dee Woolem also toured perfroming his Fastest Gun Alive act for Kilgore Toy Company. Kilgore manufactured a line of cap guns. Woolem designed a unique set of toy guns for them. Two guns, one with blue handle and one with red handle. These attached to a large plastic steer skull with electric leads, and the skull had a red eye and a blue eye. Battery operated, the skull would indicate which gun fired a cap first by lighting the red or blue eye. 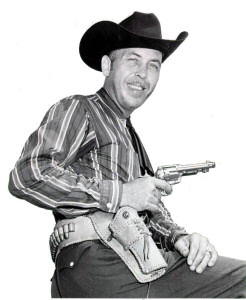 Woolem's picture as Four Time National Fast Draw Champion appeared on the lid of the large cardboard box which the set, skull, two guns and two plastic holsters, came in. Dee toured the US, appearing in department stores that sold Kilgore toy guns. During this time of promotion, Dee helped train people in how to perform a safe Fast Draw, and organized clubs across the United States. Over the years the organized sport of Fast Draw has seen a number of changes in styles and equipment. In 1976 the two largest associations in the sport, the Mid-Western Fast Draw Association and the Western Fast Draw Association, merged to form the World Fast Draw Association. Today the sport of fast draw is still alive and well and seeing a resurgence in interest. The equipment has moved with the times, but the fun and camaraderie is still the most important aspect of the sport. Thanks to Bob Arganbright for his research. Take a look at the Clubs, Associations and Publications that have played a part in the history of Fast Draw.